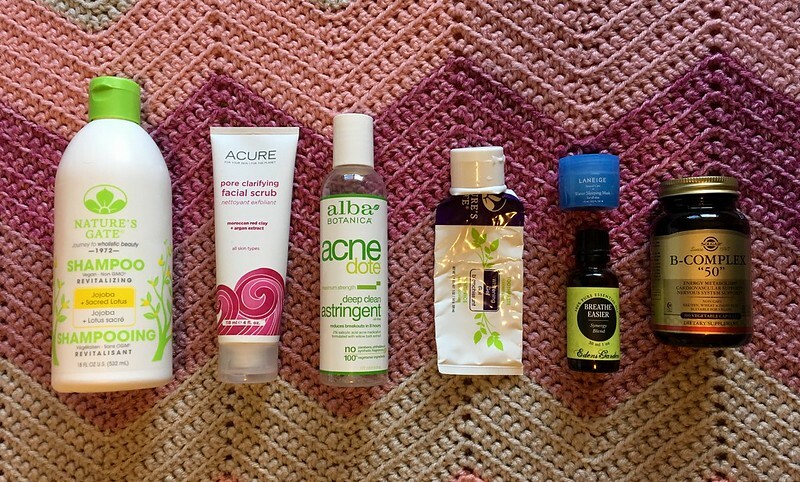 Another round of empties… and it’s a total mixed bag! Another month, another round of stuff I used up. 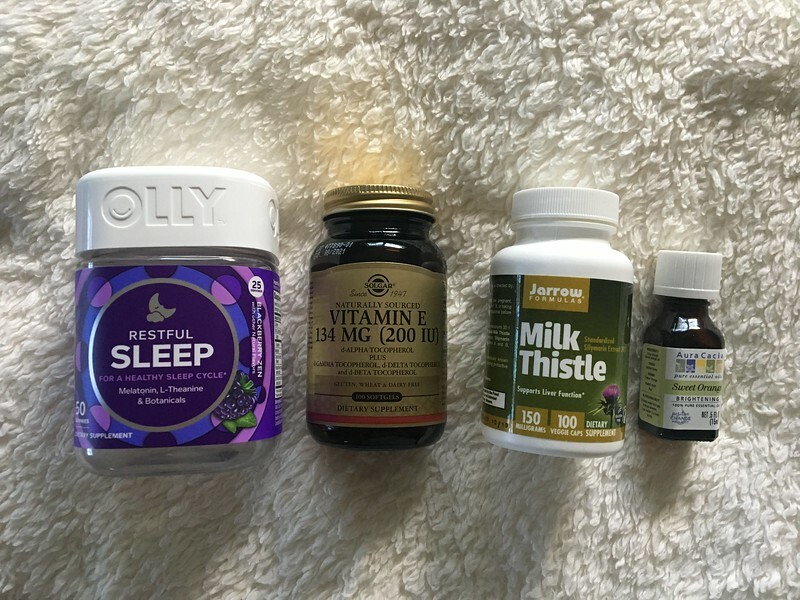 Kicking it off with the supplements… my doctor is in awe of my self-experimenting and documentation. Vital Proteins Collagen Beauty Water: Watermelon Mint – Have to admit, this tastes pretty awful until you get used to the flavor. I’d much rather use the Collagen Peptides, but I decided to try this to flavor my water during the summer. I used it up, but it took some time. After trying a different flavor (and finding it just as bad), I’ll be sticking to the Peptides in future. 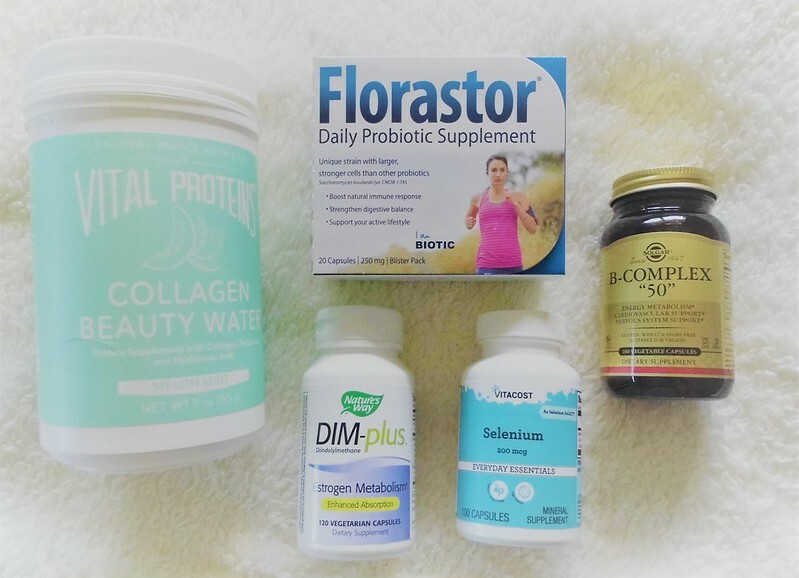 I take collagen for my joints and find that it does ease my aches. Also, an extra source of protein since I tend to have a carb heavy diet on most days (especially after going mostly plant-based). Florastor – I had a nasty bout of tonsillitis in July (still not over it), and had to take a round of antibiotics. Once upon an infection, a doctor recommended this brand and I turn to it whenever I need to take antibiotics. Nature’s Way DIM-Plus – My first bottle and not my last. I started taking DIM because it works to balance estrogen in the body. I’ve been taking it for three months and have seen a significant change in my charts, as well as my overall mood and health. I’ve had fewer migraines since taking this and I am convinced this is due to the estrogen that it helps metabolize (I take it with milk thistle to detox my liver – where excess estrogen is stored). Vitacost Selenium – Selenium is important for thyroid health and *newsflash* I’m hypothyroid. I recently started a multi that includes selenium, so I’m not supplementing for the moment. I took it in conjunction with Vitamin E and noticed some improvement in my nails (there is a kind of nail splitting that happens when thyroid hormones are not being produced or taken up by the body). Solgar B-complex 50 – Not supplementing at the moment because of the multi noted above, but I used to take it for energy and metabolism. Sometimes, it made me a little too hungry. Suntegrity 5-in-1 in Fair – I’ve tried the Suntegrity Light, which is too warm on me, and decided to give Fair a chance. It’s nice, but still not my favorite. I’m currently using their moisturizing primer, which has a different texture and no tint, but smells very strongly of orange jellies. Andalou Naturals A Path of Light hand cream in Lavender – At first, I hated the smell. I don’t love lavender (I meant to buy the citrus one and grabbed this one by mistake), but I grew used to the smell and I really enjoyed the moisture. 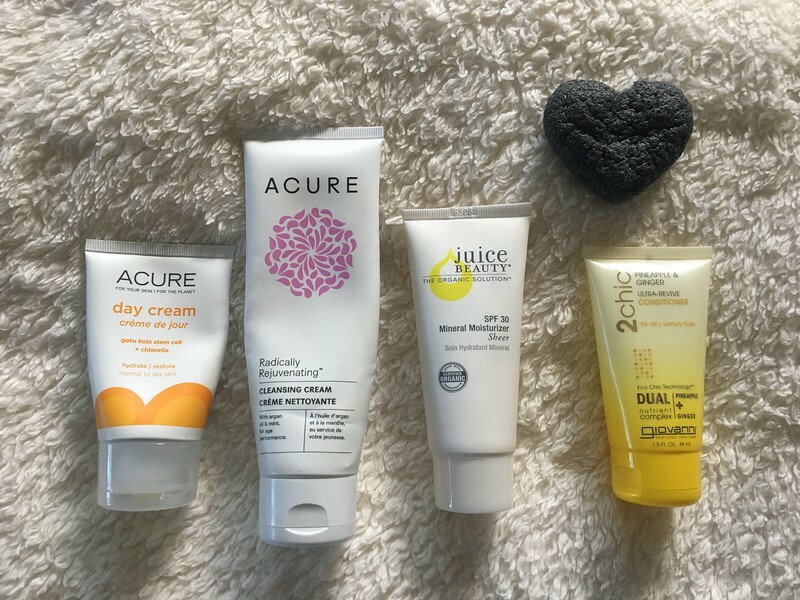 ACURE Brilliantly Brightening scrub (trial size) – My BF recently noticed the number of ACURE products in my bathroom… they work well and are an affordable eco option if you’re trying to switch to a more natural skincare routine. I like this scrub, but the full size tends to go bad in my shower if I don’t use it quickly, because it’s so hot in my apartment. This trial was just right. 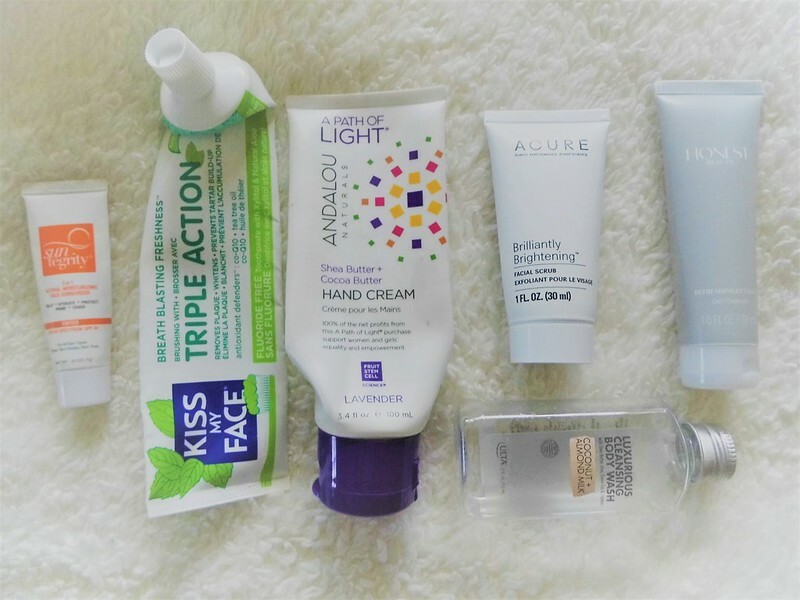 Honest Beauty cleanser (trial size) – This was part of a Target beauty box. I always wanted to try the Honest cleanser and I’m glad I got to use a trial because it’s not a keeper. I used it while traveling and had to wash my face two or three times to get the makeup off. I ended up using it as a second cleanse to finish it up. Not buying a full size. Ulta Luxurious Cleansing Body Wash in Coconut + Almond Milk – Have to admit, this was an impulse buy that was on clearance, but I like a bit of bubble in my bath. Nice scent. The red and green ones are actually declutters. I gave up on trying to use them because they were always scratchy and dry. They were part of a set that I plan to give away at work (where pens walk away on a regular basis). 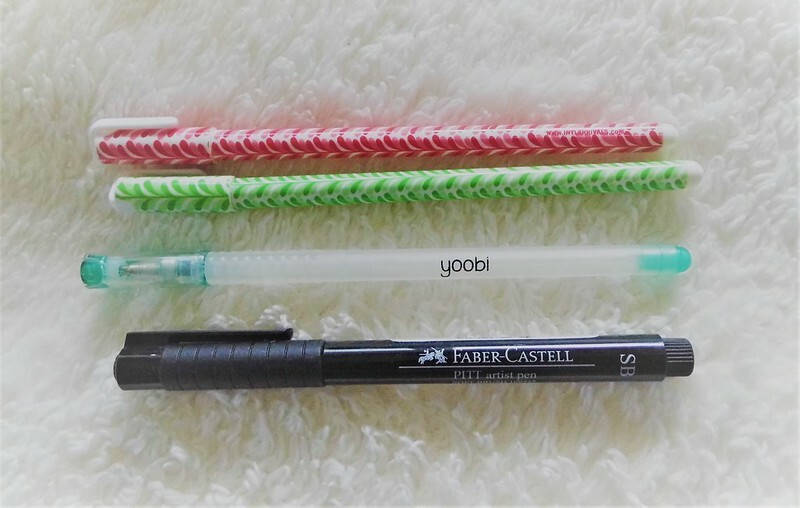 I used up the yoobi and the Faber-Castell was a mediocre brush pen for calligraphy that didn’t quite work out. 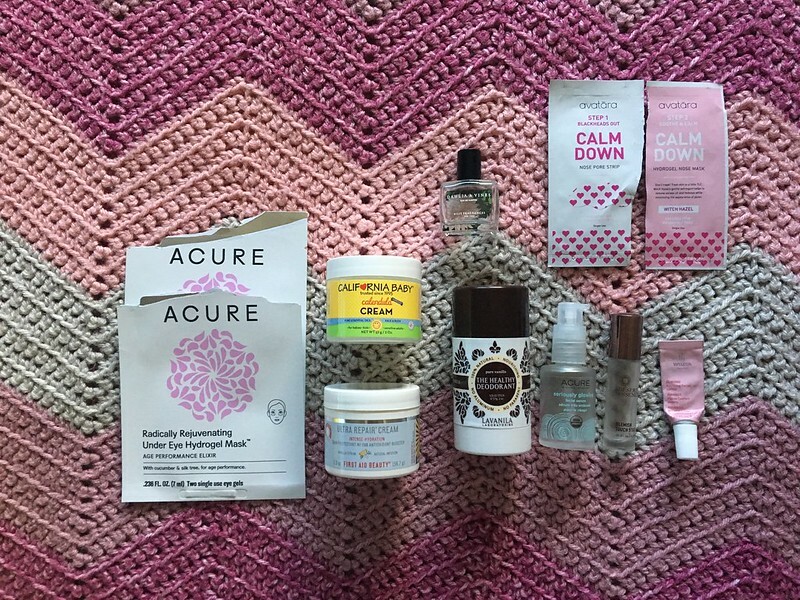 What I used up in May. 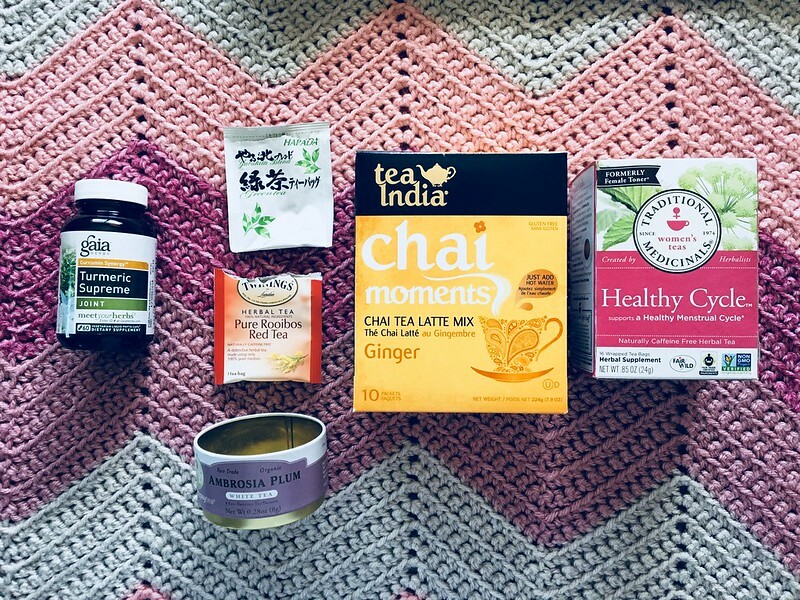 Body care and supplements. Me! bath tini ME! Lavendar Lullaby bath bombs: These were part of a Target sample both and proved to be a pleasant surprise. It brought three little bombs and they were perfect and nicely scented. Dr. Bronner’s 18-in-1 Baby Unscented Pure Castille Soap: This is the workhorse: hand soap, brush cleaner, body wash, I may not have 18 uses, but it’s a fave. Oral B floss: True confession: I hate flossing. My teeth are crazy tight and I’ve yet to find a floss that doesn’t get stuck. This one was ok.
Weleda Sea Buckthorn Creamy Body Wash: Another sample bag trial. Smelled like orange peels and felt like the L’occitane Almond Shower Oil. 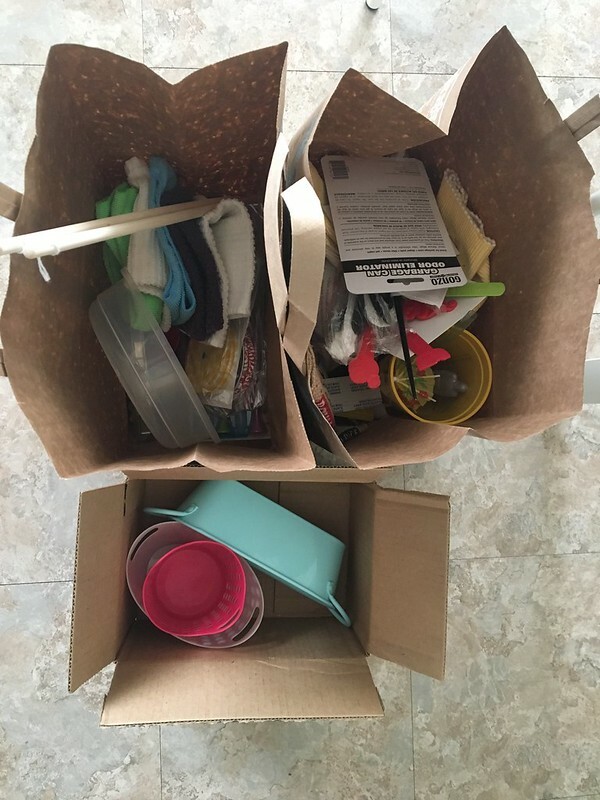 wowe wooden toohbrush: Not really an empty so much as a new addition… I went through all the plastic toothbrushes I had and made the switch to bamboo. So far, I’m impressed by the quality and like that they come in a 4-pack that will get me through the year. They’re no more expensive than plastic brushes. win-win. 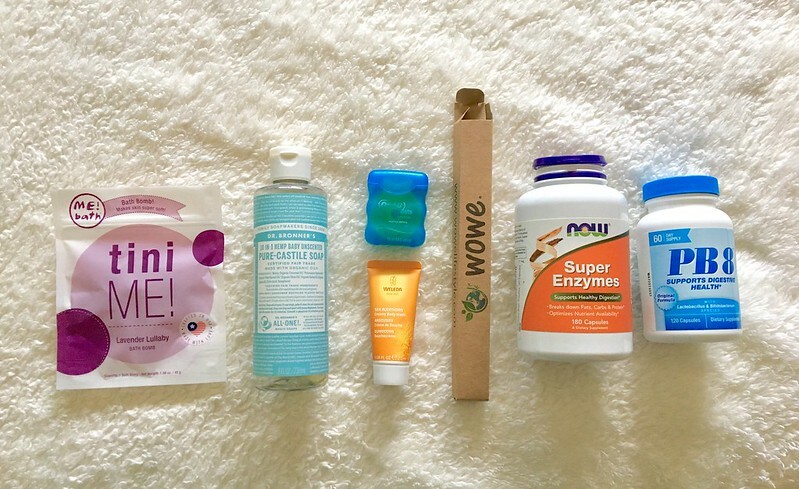 NOW Foods Super Enzymes: The best and always a repurchase. I started using these after my gallbladder surgery, when I started to have issues with food intolerance. They make my tummy happy and I can double up when I choose to indulge in something problematic, like ice cream. PB8 probiotics: Another frequent product. I alternate brands, but this is a trust fallback. As with the enzymes, probiotics keep my gut working. ACURE radically rejuvenating under eye hydrogel masks: I’ve posted these before. Love them and they’re easy to find at my local Target and Whole Foods when I need a pick-me-up. California Baby Calendula Cream (for babies and sensitive adults… I’m def. a sensitive adult): one of my favorite creams when my skin is reacting or experiencing a psoriasis flare. First Aid Beauty Ultra Repair Cream (citron scent): Another good cream when I’m experiencing a flare. 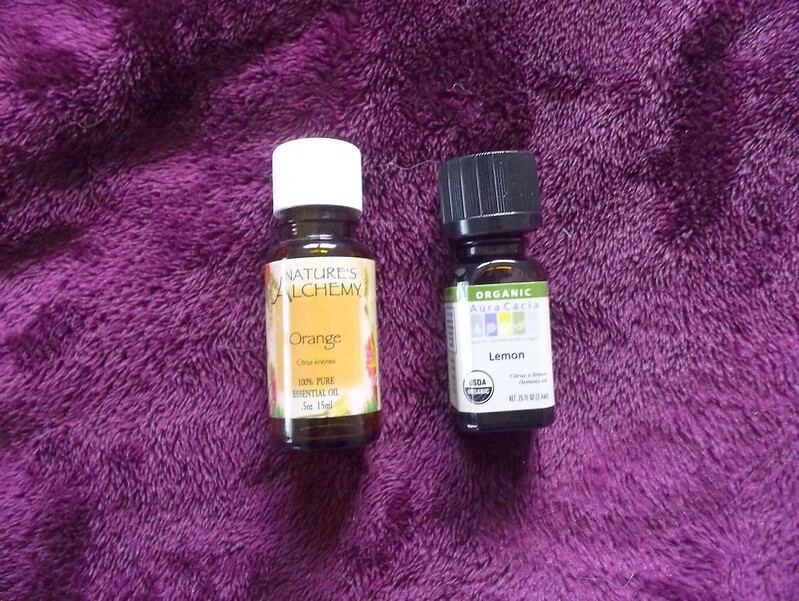 The active ingredient is Colloidal Oatmeal and the orange scent is lovely is you like a light citrus (fades quickly). NEST fragrances in Dahlia and Vines: at the time of purchase, this was a Sephora exclusive scent. Light and floral, lasts a long time and didn’t give me a headache (always a win). LaVanila The Healthy Deodorant, vanilla scent: When I’m not using Schmidt’s bergamot and lime, I’m using this. It works for me, but deodorant works differently on every body. If you’re new to natural deodorants, this might not be enough to cover the initial detox stank. ACURE seriously glowing facial serum: This was a nice blend of nourishing oils, just what I needed when my skin was going through a dry spell. ACURE may have discontinued or renamed this since their rebranding. Desert Essence spot treatment: one of my favorites. Weleda Almond Lotion sample: Came in a sample baggie. I’ve used this before and continue to enjoy it. Very light moisturizer. avatara Calm Down blackhead pore strips: bought these on a whim at Target, they really work. Traditional Medicinals Nighty Night: for when I need a little help to fall asleep. Mr. Bubble Meltaways Bath Candies: part of a Target discovery box. They do what they do. Kiss my Face Sensitive toothpaste, orange mint flavor: My favorite SLS/fluoride-free toothpaste. Been using it for at least 2 years. Weleda salt toothpaste: This… was weird. Part of the same Weleda bag mentioned above. I recently devoured Sarah J. Maas’s Court of Thorns and Roses series (minus the recently released novella, which I will remedy forthwith). Faeries, complex characters, and unexpected sexiness, this is the kind of story I wanted when New Adult became a thing (and completely failed to meet my expectation). I also mention the series in the video below. The heat is on and I’ve been feeling nostalgic. I decided to switch my usual RMS blush for an oldie but a goodie: Benefit Dandelion. I wore Dandelion for years (through college and beyond), but stopped using it after greening my makeup. It’s not clean; it’s not cruelty free; it is all things bad and evil, but I love the color and I can live with my poor choices. Episode 10: Gotham by Gaslight (hosted by yours truly) is now available. This episode focuses on Gotham by Gaslight (the film and graphic novel) and general thoughts on BatCat. You can find the episode on Podomatic, Apple Podcasts, Spotify, and Google Play. 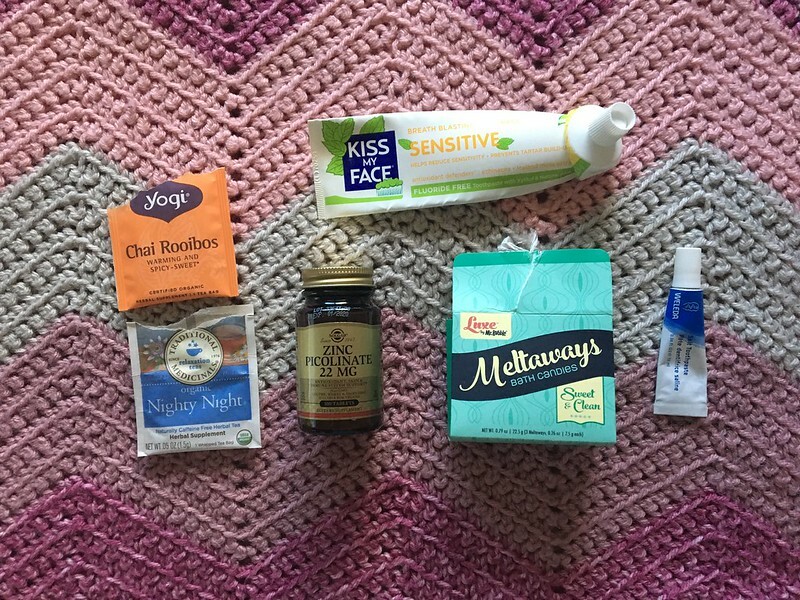 Health, writing, books, and tieks! ACURE facial cleansing gel: Picked this up after I ran out of my last wash. Nice and gentle, but it did not last as long as the cleansing creme from the same brand. Kiss my Face moisture shave: Lasts FOREVER and makes my skin incredibly soft. The peppermint is especially cooling during the summer. Always repurchase. Solgar Vitamin D3 2200 IU: I regularly take Vitamin D to help with my lack of energy (hello, thyroid). I amped it up to 2200 IU, but I’ve since switched back to 1000 IU because I’ve started taking Cod Liver Oil again (which also has Vitamin D). gaia herbs Turmeric Supreme Joint: I don’t take this regularly, but it’s helpful when my TMJ is flaring and I think it has some effect on my migraines (needs further testing). I’ve switched back to the Extra Strength, which is a slightly different blend of herbs. 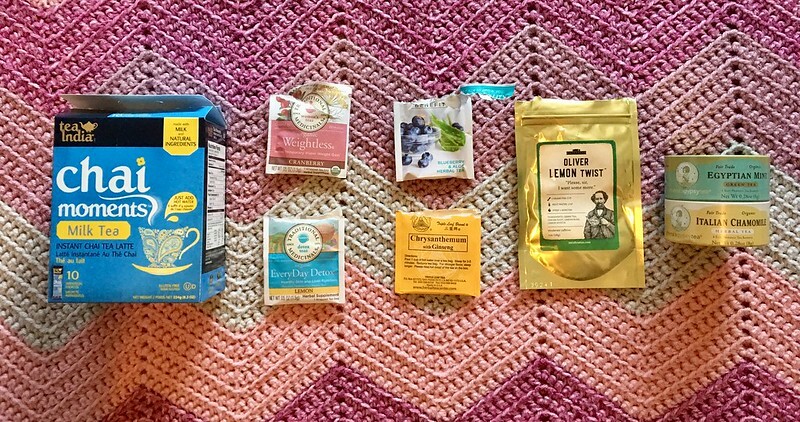 Japanese green tea, Twining’s pure rooibos red tea, and Zhena’s Ambrosia Plum white tea – three teas done! Tea India Chai Moments Chai Tea Latte Mix, Ginger: The last of the chai mix I purchased at the Diwali festival. Will miss it. Traditional Medicinals Health Cycle: A regular repurchase. Helps with cramps and makes my stomach feel less awful. Happy Easter! Here’s what I used up in March. 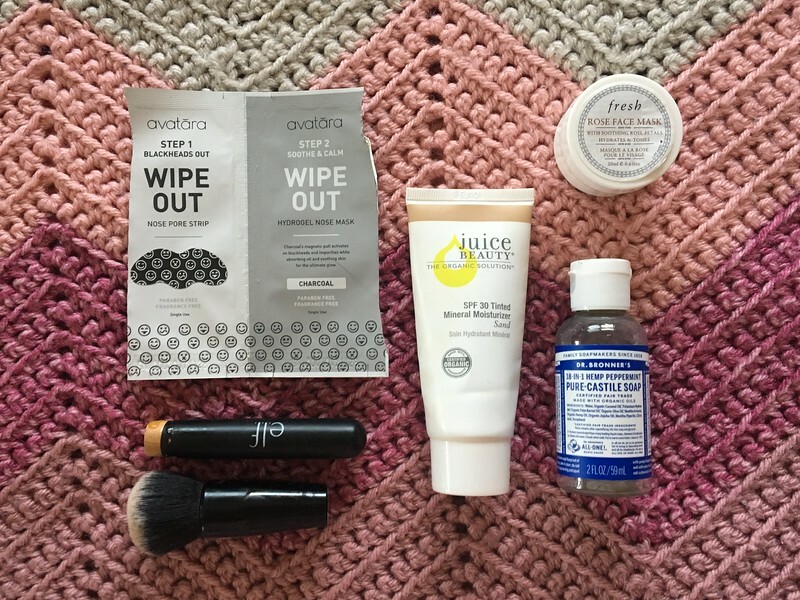 avatara wipe out nose pore strips: first time using these and it was quite a nice experience. I picked them up at Target and definitely noticed a difference. Juice Beauty SPF 30 Tinted Mineral Moisturizer in Sand – One of my favorite sunscreens. It just matches my skin tone without turning orange. Currently using the un-tinted one in an effort to simplify my makeup look. fresh Rose Face mask – sample from Sephora. Just a lovely mask that leaves my skin feeling soft and refreshed. I’d be willing to buy a trial size in future. Dr.Bronner’s Pure Castille Soap in Peppermint – a classic. This is a trial size because I like to rotate the scents and even the small size goes a long way. 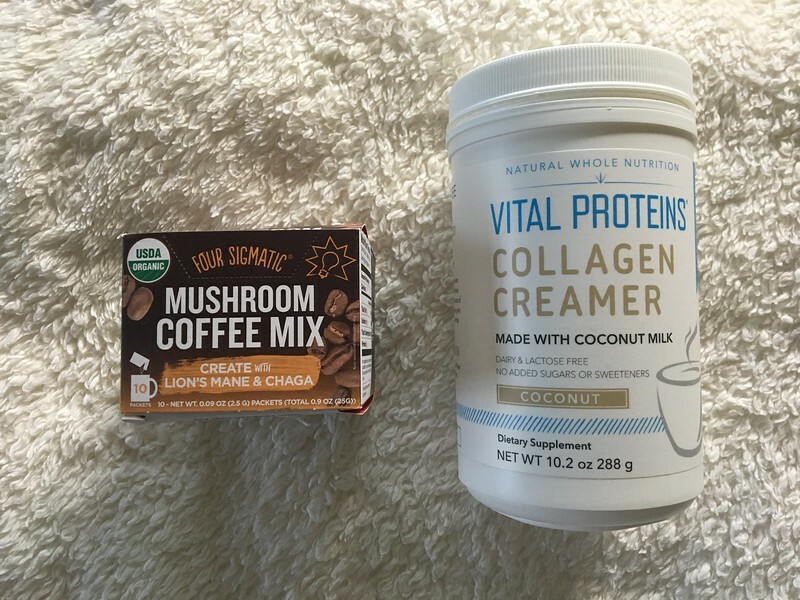 Vital Proteins Collagen Peptides – My favorite collagen supplement for skin and joints, but it’s pricey and I can’t always justify the cost. 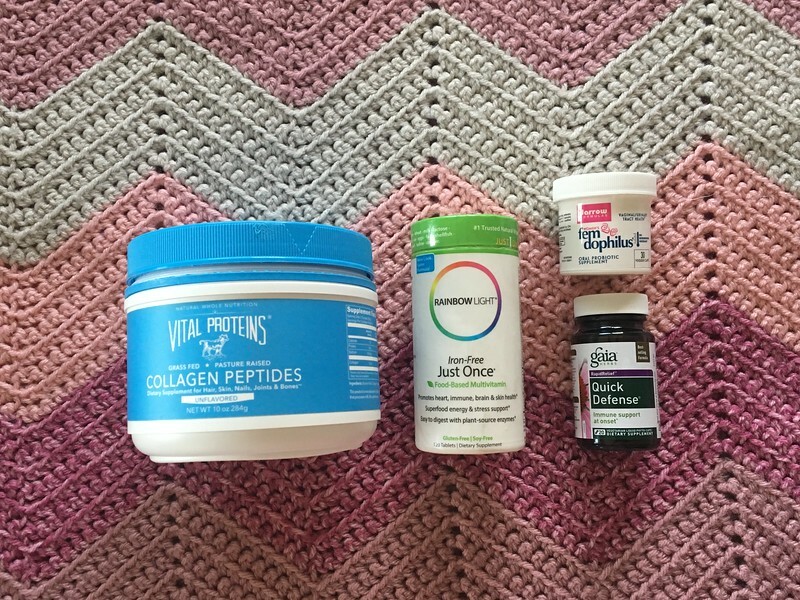 I splurge when my knees are feeling particularly achy, or I want a skin boost. Rainbow Light Just Once Iron-Free – The best multi I’ve tried and one I continue to purchase. Jarrow Formulas Femdophilus – Probiotics for ladies. ’nuff said. I can’t say I noticed a difference, but it was on sale and I thought it worth a try. 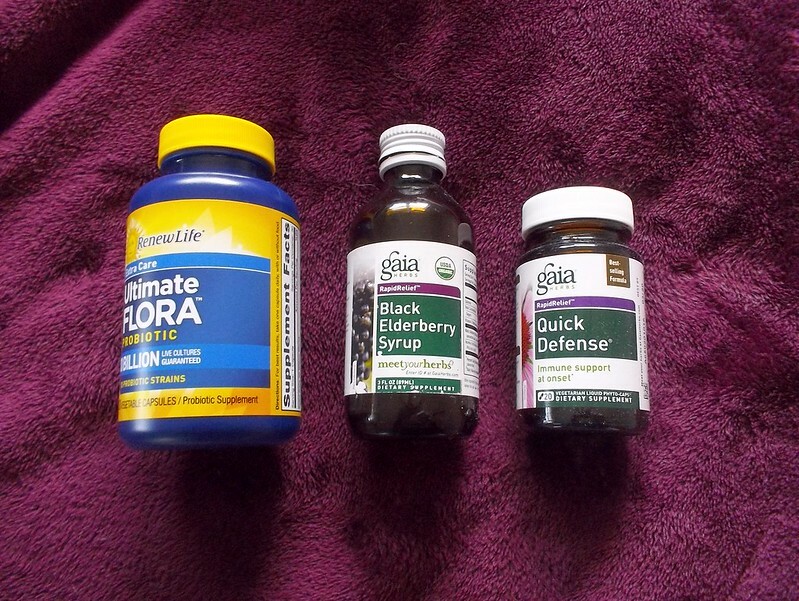 Gaia Herbs Quick Defense – This is one of those products that I try to push on people. I keep a bottle on hand for colds and flu and it WORKS. It speeds up a cold like you wouldn’t believe. A pen – Because every pen is a success. 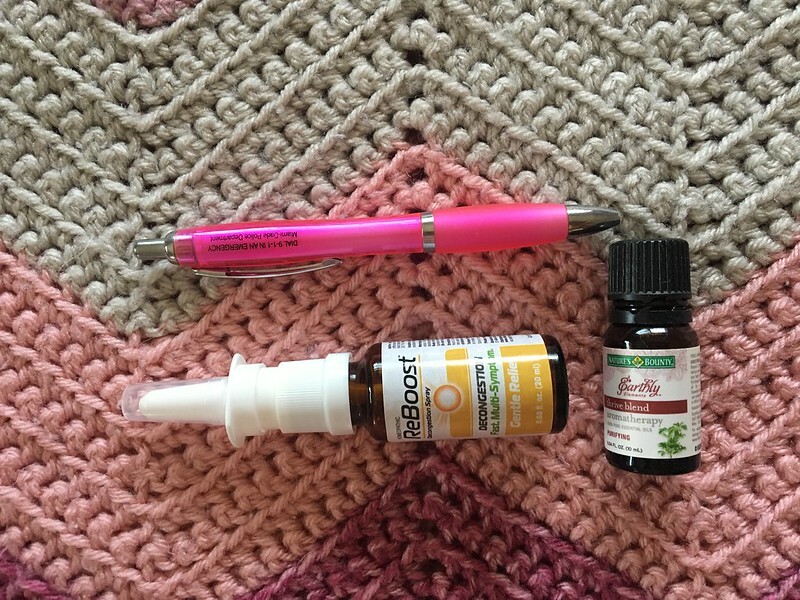 Re-Boost decongestion spray – picked this up a few months ago and it’s come in very handy. It’s a natural product that actually works to clear things up. Nature’s Bounty thrive blend – It smells strongly of clove but I like to think that it works to clean the air during cold season. At least it helped when I was stuffed up last month. Andalou Naturals Un-tinted Benefit Balm – I use this for the SPF 30. It leaves a mild white cast but it almost acts as a primer for my makeup. It’s not my favorite, but it works for every day sun protection. 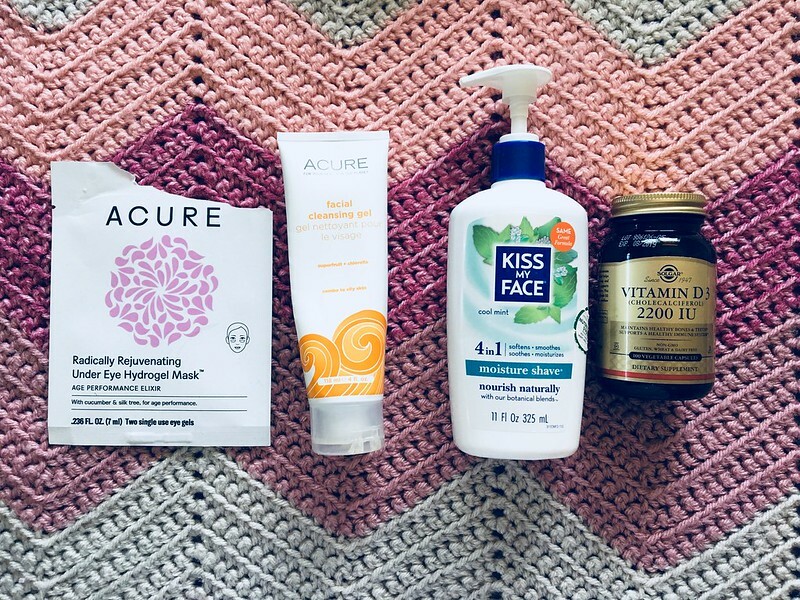 Acure Facial Cleansing Creme – I prefer the regular cleanser, but my skin was feeling a little dry and sensitive, so I decided to give this one a try. It feels like a balm cleanser and works best as a second cleanse after removing makeup. 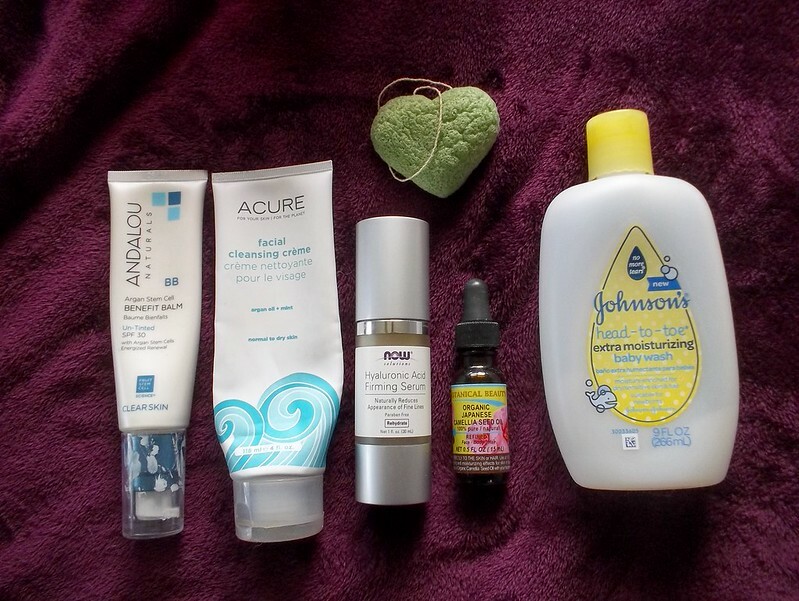 NOW Hyauluronic Acid Firming Serum – I love this and started a new bottle as soon as I ran out. It’s very light and acts as a moisturizing serum beneath my oil and sunscreen steps. Botanical Beauty Organic Japanese Camellia Seed Oil – there is some debate as to whether the purity of this oil (amazon comments controversy, as per usual), but I credit this with helping my hair grow and become more smooth and manageable. It is my only form of conditioner and I use it on my ends and the lower half of my scalp where I tend to have some mild psoriasis. I love it and I already opened a larger bottle. Johnson’s Head-to-toe extra moisturizing bath – I needed some moisture and I like baths. I like citrus scents. These are from my office oil collection. Frostbeard Book Lovers’ Soy Candle sample in Pumpkin Juice – this was milder than I expected. It has a nice spicy scent and does not linger. 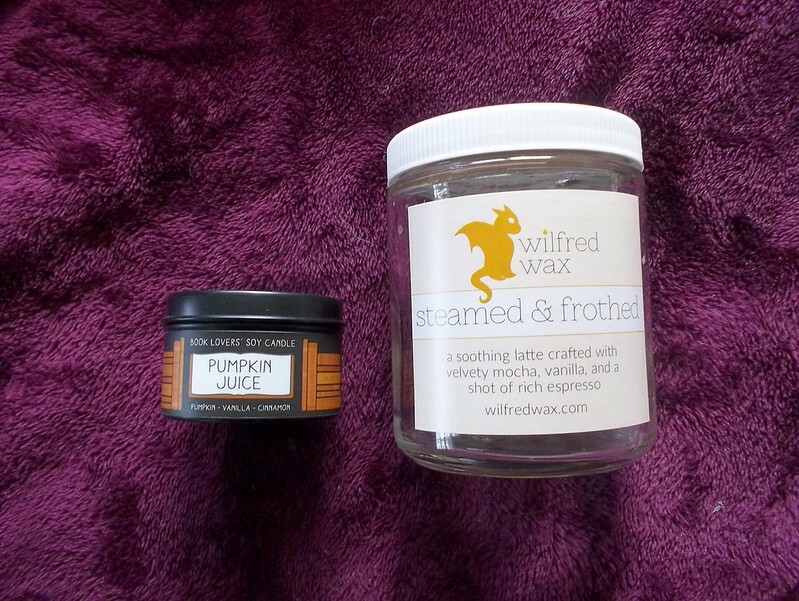 Wilfred Wax Steamed & Frothed – one of my favorites. It’s soooo sweet though, a little goes a long way. I will replace this when I run out of my other candles.